According to figures released by the UN refugee agency on World Refugee Day (June 20th), there are 16.7 million refugees, 1.2 million asylum seekers, & 33.3 million internally displaced persons in the world today. Staggering figures, but since the UN carefully parses definitions, these figures do not indicate the real number of human beings made homeless or compelled to hit the road. Internally displaced is such a delicate expression for those millions who have been bombed out of their homes or are fleeing from war zones & military occupations. They haven’t joined the millions fleeing their countries but remain homeless right at home. Half the world’s refugees are now children, just like they make up so many of the world’s homeless, or “internally displaced” persons. They are the offal egested by neoliberal plunder & damn it before every standard of human civilization & culture. These little ones, despite their daring & desperation, are vulnerable to every kind of violence & shyster. Obama spouts pieties about equality & children & Hillary Clinton made swag off writing “It Takes a Village” advocating child welfare. She also made a display & built quite a reputation for her association with the Children’s Defense Fund. They’re both now calling for the mass deportation of children refugees crossing the US border. Just like ignorance of the law is no excuse for miscreants, neither is being entirely bereft of human decency or making a pitiful spectacle of the refugee problem. It’s admirable the UN refugee agency keeps abreast of the scale of the refugee problem but why can’t it bring itself to denounce the wars & barbaric plunder creating it? Pity-mongering does not constitute political action & calling for the deportation of children puts you in a special class of criminals; it also merits you a special place in hell. 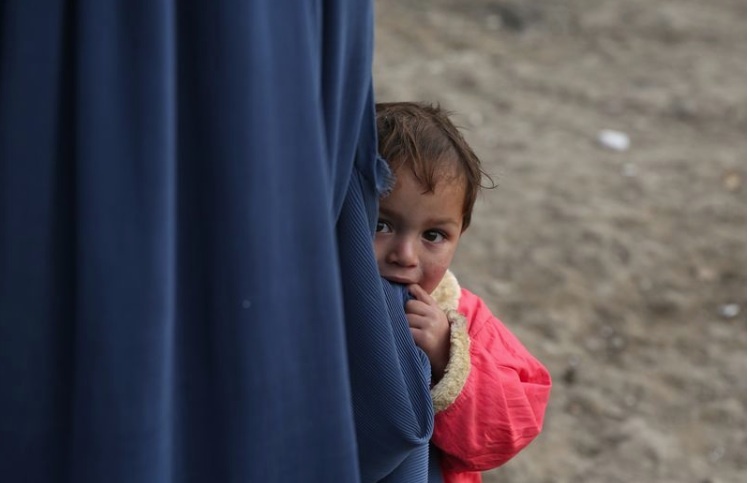 This little Afghan boy hiding behind his mother’s veil is an “internally displaced” person in Kabul. We don’t need any more sob stories out of the UN; we need to demand US-NATO out of Afghanistan! US out of Iraq! Today the UN commemorates World Refugee Day. In their 1951 Convention Relating to the Status of Refugees, the UN laid out who does & does not qualify as a refugee. The UN definition has been parsed several times since 1951 because colonial wars & economic plunder have made such a mess of this world that millions have been uprooted & don’t fit any tidy bureaucratic schema. All they know is that where they live is a hell hole & they need to get them & their families out to survive. The protocols exclude war criminals but all those guys have money in Swiss bank accounts & buy their way across borders. Who needs a green card when you can afford a chalet in the south of France? They also exclude “economic immigrants”–that is, millions of people displaced by neoliberal plunder & IMF-World bank austerity programs. But there are still millions of refugees who fit the UN’s narrow schema from Syria, Libya, Somalia, Eritrea, Mali, Central African Republic, Congo, Uganda, Sudan, South Sudan, Afghanistan, Iraq, Pakistan. The UN commemorates World Refugee Day with videos of celebrities honoring the “strength & resilience” of refugees. Sentimentality aside, the brief videos show footage of the horrors refugees are fleeing & the misery of their flights. And that’s good because we need to look human suffering straight in the face in order to be part of ending it. But what the UN doesn’t do is publicize or denounce the treacheries of European Union countries in preventing refugees from entering by putting up a surveillance fortress around its borders. Thousands of those refugees & immigrants drown in the Mediterranean Sea trying to cross in rickety makeshift boats when if the EU honored the UN protocols they would be providing ferries & ships for safe passage. 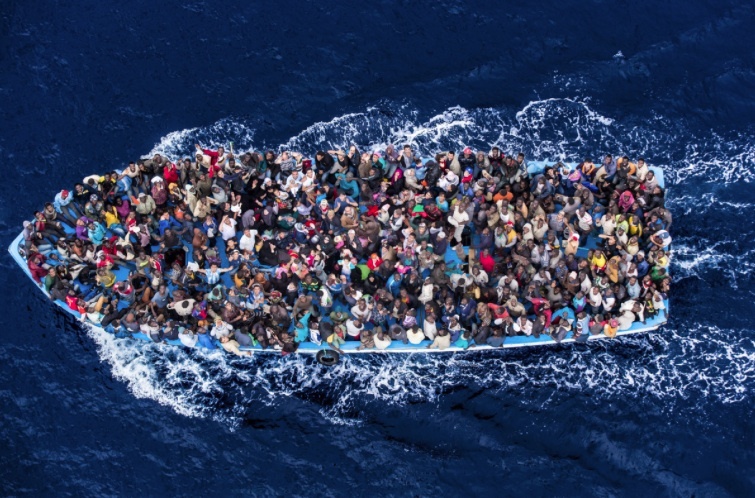 In October 2013, a boat carrying hundreds of refugees, mostly from Eritrea, Somalia, & Ghana, sank off the coast of Lampedusa (near Sicily) trying to reach the immigrant processing center located on the island. 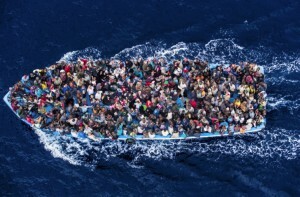 364 people drowned amidst charges by local fishermen that the Italian coast guard bungled the rescue attempt. Despite protests by Italian human rights activists, Italian residents of Lampedusa, survivors of the accident & other detainees at the Lampedusa refugee center, the Italian government moved the bodies of the drowned to Sicily & buried them in scattered, unmarked graves. Survivors were unable to attend the memorial service or hold funerals for their own loved ones. The number of refugees & immigrants trying to reach Italy is over 40,000 so far this year, which is more than the total that arrived in 2013 & does not include those immigrating to Spain or Greece. Italy claims it “rescued” 5,200 just in the span of four days. After the Lampedusa accident & guided by those UN protocols, why isn’t the Italian coast guard providing safe passage to those people? Rather than spending millions of those euros on “rescuing” people, why don’t they use the money to provide ships? Human rights activists don’t accept the UN distinction between refugees & immigrants. No human being is illegal. We don’t care why they’re leaving their countries; we only know they have a right to try to make a better life for themselves. Immigration is a human right! Open the borders! Down with Fortress Europe!